When it comes to personality type, most of the time I try to write about the potential and positive characteristics of each individual. However, there are healthy and unhealthy versions of each Myers-Briggs® type. 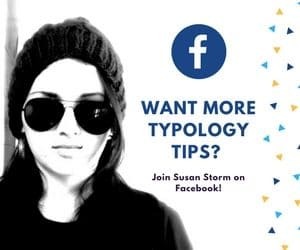 Just having a personality type doesn’t automatically mean you’ll use your gifts in a positive way. For example, Mahatma Gandhi is a healthy INFJ. He was empathetic, compassionate, and visionary. Adolph Hitler was also an INFJ, he was destructive, hateful, and an ego-maniac. Environment, upbringing, and life choices can change how you use what you’ve been given. 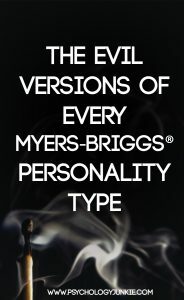 Each and every Myers-Briggs® personality type is capable of amazing things and terrible things, depending on how they choose to use what they’ve been given. You will probably not relate to these type descriptions!!! These descriptions describe some of the worst versions of each type. They do not describe the average or healthy versions of each type. Almost anyone you meet will not fit these descriptions. These descriptions go into detail about how each type can use it’s cognitive functions and natural processes in a negative or unhealthy way that is destructive to the people around them. Do you have any thoughts to add? Share with our readers in the comments! Interesting! I believe that we are all born as the “evil versions” of our personality types and need divine intervention to become the “healthy versions” of ourselves (more like God). I have thoroughly studied many -ologies (still love psychology and typology! ), systems, etc. and I’ve discovered that we cannot educate or actualize ourselves out of our own sinful nature into self-improvement without God’s makeover grace. Only Jesus saves us from our evil selves. Those who have been “saved” are learning to become more like the healthy versions of how God created us to be (mini versions of Him filtered through our created personality). Any goodness visible in us is a gift from God (that came through someone praying extensively and intensively for us to receive it). For I was born a sinner— yes, from the moment my mother conceived me. But you desire honesty from the womb, teaching me wisdom even there. You used to do these things when your life was still part of this world. But now is the time to get rid of anger, rage, malicious behavior, slander, and dirty language. Don’t lie to each other, for you have stripped off your old sinful nature and all its wicked deeds. In this new life, it doesn’t matter if you are a Jew or a Gentile, circumcised or uncircumcised, barbaric, uncivilized, slave, or free. Christ is all that matters, and he lives in all of us. Since God chose you to be the holy people he loves, you must clothe yourselves with tenderhearted mercy, kindness, humility, gentleness, and patience. Make allowance for each other’s faults, and forgive anyone who offends you. Remember, the Lord forgave you, so you must forgive others.